The Peskitoriantais - My New Creature - 2 Year Anniversary! 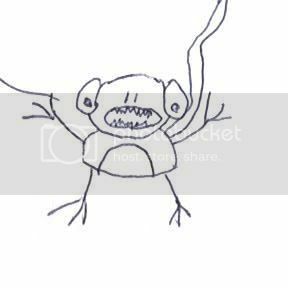 Topic: The Peskitoriantais - My New Creature - 2 Year Anniversary! Would You Download the Peski's When Spore is Live? The Peskitoriantais live on a planet called Nairot in the Iksep galaxy. 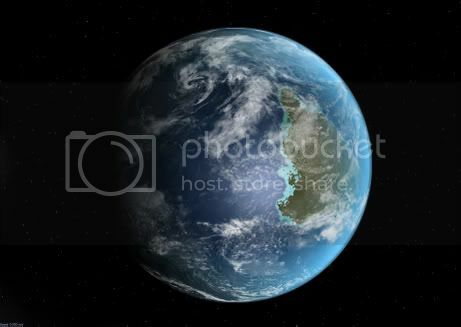 Surrounding planets include: Calp, Toofie, Warrab and Niam. The star that these planets revlove around is called Ezis. 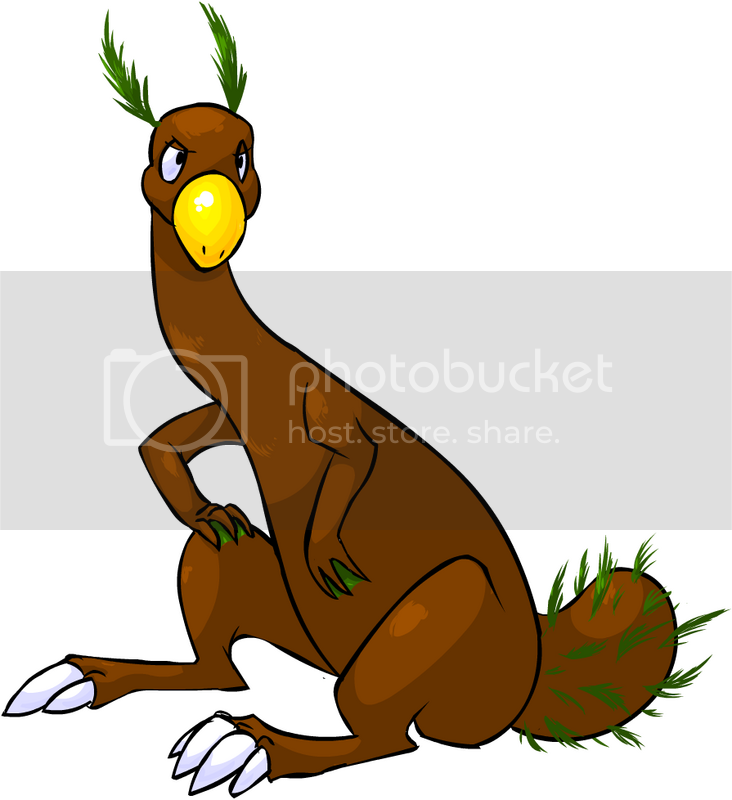 The Peskitoriantais are a race with long necks that can eat the very tips of trees. The have frog-like hands so that they can propel themselves through the water very easily. The bump at the very end of the spine was once a tail, but over many generations, it was lost because of no need of it. The have a beak at the end of their snout as their mouth. The tip of the head is about as tall as an elephant, and it is about as long as a regular human car if they are on their 2 legs. Back in the early stages of the Peskitoriantais evolution they did walk on all fours. The Peskitoriantais live to be about 200 years old in human terms. But their way, they live to be about 45 feathers! The Peskitoriantais live in a medium sized group of about 8. They don't usually eat meat, unless it is their number one predator, the Sia (Sia are little monkey like animals that pounce on the Peskitoriantais because they move kind of slow. The Sia have little sharp teeth and can even take on an animals are big as a whale if in a group). The Peskitoriantais are mainly eat their favorite plant, the Viale. It is the size of a bush and sprouts very tasty fruit and flowers for them to munch. The buildings architecture are very tall and leafy green. The Peskitoriantais aren't the smartest people, but they can at least control a planet. The way of life is to try and be friends with everyone you meet, but if a creature shows aggression, then they attack and attempt to dominate and wipe out their race. The Peskitoriantais try and teach the whole universe to be friendly and kind to all other creatures, big or small. They want to end war and for everyone to be treated equal. But, does that mean that you will listen to them? Ramshai, main city. Those are mountains in the back. They live in the Iksep Solar System! 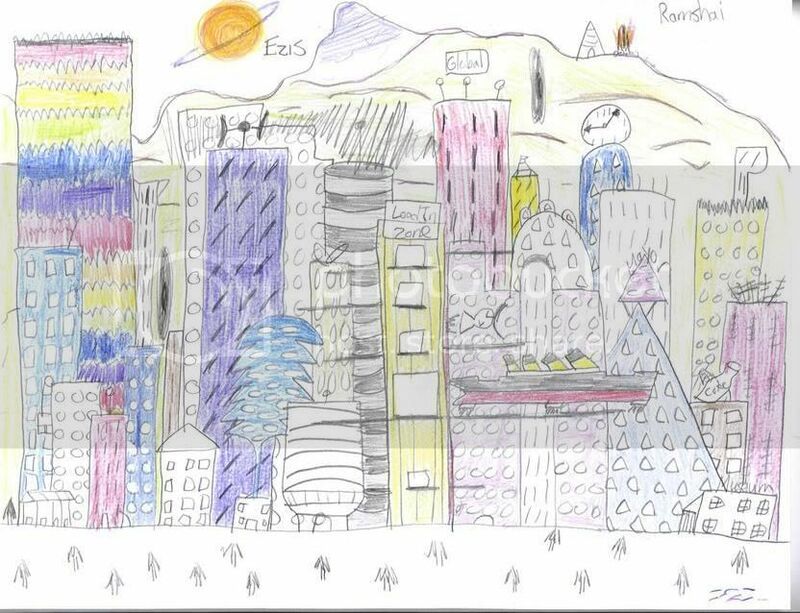 The Peskitoriantais have now created 15 new cities that are becomming vibrant and bussling with growth. They have allowed for other creatures to become residents in Nairot, but only in the island of Ennae. Each of the main original cities have expanded up, and out. In a couple of centuries, it would seem that the whole planet will be 1 city... which will eventually happen if no catastrophes exist. Hope that was a good summary! Aww. I like them. Hope to see more. more? i can easily add a story of some kind to them. Well, more background... more about their culture, what theyre buildings look like. That kind of stuff. The Peskitoriantais are desendents of the Toriantais. The Toriantais were much more cavemen like and walked on all 4 legs and also had the full tail. 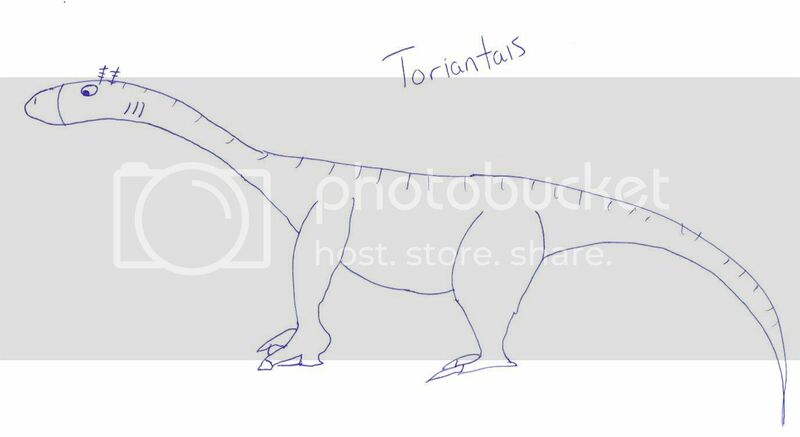 Because the Toriantais were so much closer to the stage of just comming from the water, they still had their gills, but also had fully functional lungs. They have learned to use their backbone more and walk on 2 legs now to reach up to the top of the trees. On the planet of Nairot, everyone got along. There were many trades between the few types of creatures living there: Torianstais, Sia, Optrera, Aecivo, and Ruean. There was an obundance of plants, and all 5 species were evloving and advancing themselves into the Space Age. Enough land for all the roam free and talk and play how every they feel. Water was plentiful and the air was clean and fresh. The Optrera found a new planet close by that they wanted to colonize for themselves because they knew something bad was going to happen to their planet. Out of all the creatures, the Ruean were the smartest of them all. They already had a spaceship and was getting ready to take off and leave, until with their superpowered telescope, saw a meteor shower heading straight for their home planet of Nairot. So they must act quickly. The head of all the major cities got together to think of a plan, and it was to evacuate the entire planet. 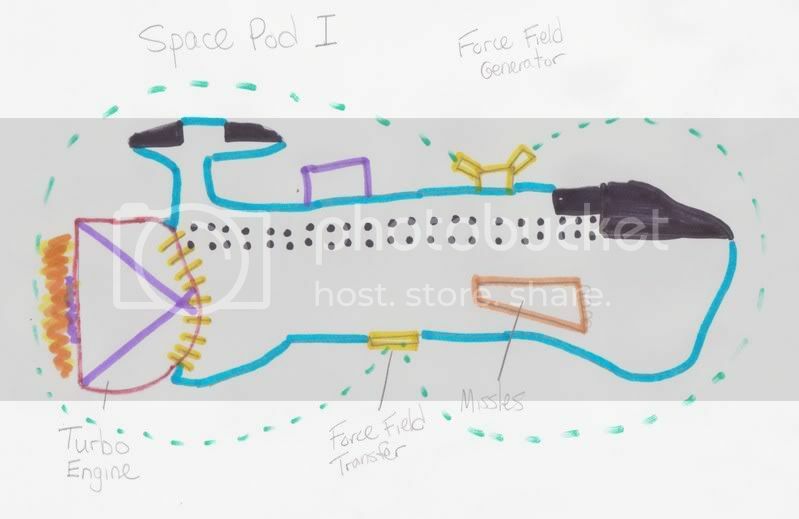 Now even a not so smart species could figure out that the amount of time they have to get everyone off was impossible, and the only ones with a spaceship were the Ruean. So the Ruean decided to leave the other species behind. And the Sia were not happy at all, The Sia attacked the Ruean city will there was nothing left but the Spaceship. The Sia got a little paranoid and took the ship just to leave the Torianstais, Optrera, Aecivo and the left over Ruean. It was only a couple of hours till the whole planet would be destroyed, until an idea popped in the Toriantais head, we have gills, lets use them. So they did their roar all around the planet for all Toriantais to head to the water, and stay there. To the other species, they had nothing of use to avoid this tragic event. So the day came, and BOOOMMMM! Meteors from all around crashed into the planet, leaving it firey and smokes clogged the lungs of any thing living up on the surface. The Toriantais swam further down and down into the water to avoid the heat. Splashed were continously hitting the waves at the top. The crash only lasted for about a few minutes, but the damage would last a lifetime. It has been a couple of weeks after the event and no more food has survived for them to eat. The only thing left were little fish, and yet they never have ate anything but plants. So now was the time to go a little carnivore. They have found that there was no use of the tails, so everyone decided to eat their own tail just to hold them over a couple more days until they head back to the surface. All the tails were gone on every Toriantais. They swam to the surface and once on to the dirty sand, they looked and saw a whole new planet, it was unrealistic. New trees had formed, new terrain and new grass. It is like nothing was there, until they saw a little Sia feasting on a dead carcass. The Toriantais met it with questions and friendliness. But the Sia didnt, and it immediatly jumped onto the neck of a Toriantais and started biting and chewing it. 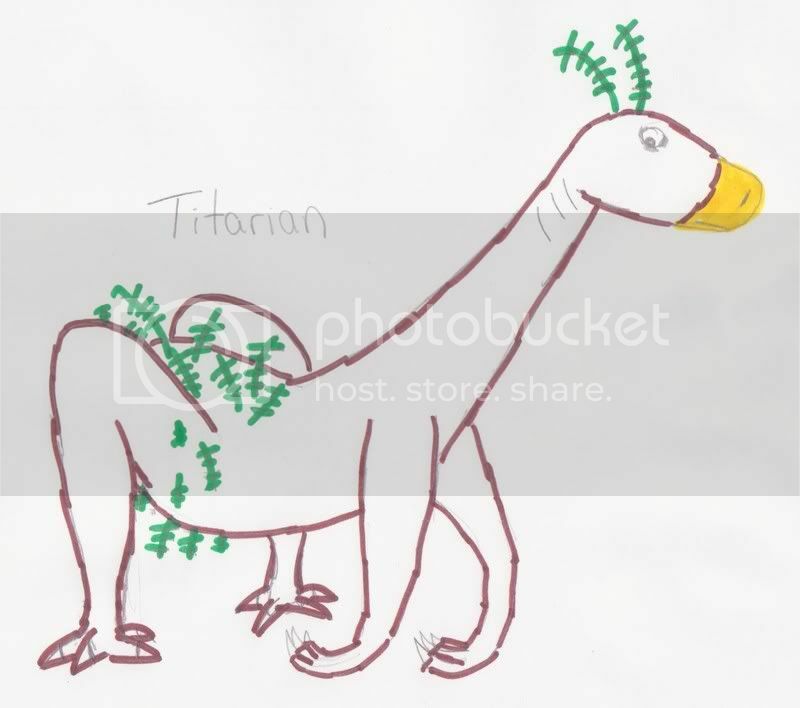 All the other Toriantais had were their teeth, so they tried to grab it with its teeth, but no use until one of them stood on the back 2 legs and punched the Sia with its front 2 legs and then went back down on four. The Sia was stunned on the ground for a few seconds and then ran away. The Toriantais liked this new way of attacking and started trying to walk on the back 2 legs until they all could do it permanently. The Toriantais have learned a new trait of annoyance and aggretion now to other animals, so they added Peski infront of their name, though it is pronounced Pesk-eh, not Pesk-E. The now new species of Peskitoriantais started building again and multiplying themselves. Since there was no other animals on the planet except themselves, they went back to being herbivores and ate plants. There was about 50 of them at the city gate. Some of the Peskitoriantais went to see what they want, but they went with speculation. They walked outside the city gates, and what is when the Sia started attacking and they kept on comming from back beyond the hills. They continuesly attacked and attacked. The Peskitoriantais were wondering how this was because no other lifeforms were here. Until they saw it, a huge UFO landing beyond the hills, and then leaving, then comming back. It was unloading and loading Sia to attack us. Thats when the Peskitoriantais started to use their lasers and destroy the spaceship. The Sia attacks soon died down, and it was temporarily over. The Peskitoriantais then soon found that planet that the Optrera also found, and the ones who now colonize it is the Sia, and it looks like they are doing very well. The war still continues, and will always continue until the Spore game is released. Whose side are you on, and will you help them? Looks kinda dragonish. I would be careful there. You should add soem more wird parts to make it look less dragonish. well it will have fur, i just didnt want to draw alot of fur, and the striped was going to be fur, but halfway through i decided not to do that. These guys are not reptiles. And im typing up the Culture thing right after this. The main culture is called "Harmolity" shortened from Harmony and Hostility meaing peaceful but aggresive. The Peskitoriantais try and be nice to all creatures of any species and try to be friends with them and become alliances for industry or trade. They want Harmolity to be showed to the whole universe in hope that everyone excepts it. But if a race doesnt accept this way of life, and shows aggression toward any creatures that do believe in it, then there will be no hesitation to hunt and destroy that other species. About every planet in the Iksep solar system share this belief, except the planet of Calp. Calp is the now home planet of the Sia who believe in destroying then conquering the entire universe. The only setback they have is the Peskitoriantais attacking the space fleets that are on their way to leave the solar system. The Harmolity was created soon after the encounter with the Sia after the meteor shower. The president of the remaining Peskitoriantais wanted to show that we can fight and for other creatures to know that we wont stand down. The whole species was raised to be nice, and always be nice and to just eat plants. But the Sia's are the ones that enforced their inner anger. So be nice and gentle to the Peskitoriantais and it will be alright for you other lifeforms. Wow... talk about passive-aggressive zero-tolerance. Your Pez-Dispensers seem even more destructive than my Necromonicons. I just want to kill and eat everything, but you want to convert them and strip them of dignity. You're like the Jehovas Witnesses of Spore. Woot! im glad i got a person that i know (hope ) will download them to their game! you can eat any other creature BUT these guys. Cause you know your going to get it. These guys are about 20 feet tall! I do believe Will said some time ago that the maximum size was about the size of an elephant. The torpals have decided not to accept your ways. *tauntingly* Whatcha gonna do about it?